This website can not calculate shipping for this item. Please order by phone, or expect shipping to added over and above what ever the website calculates. Phone 870-387-7611 Mon - Thurs. 8am - 5pm and Fridays 8am - 4pm central time. In order to save costs and be able to sell at a lower price, this item is drop shipped from the factory, we seldom ever stock them to be picked up at our warehouse! 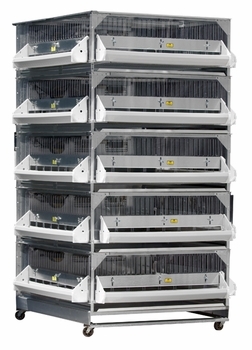 GQF battery brooders with clear panels are ideal for displaying all types of chicks in feed stores, to monitor chick conditions at a glance and to raise large numbers of birds in limited floor space. Lightweight materials mean lower shipping costs as well as easy handling of drop pans. Sturdy base with rugged casters and securely fastened brooders result in a solid stack which is movable when full of birds. Only 65” high, all tiers of 5 brooders are accessible and drop pans and floors can be removed for cleaning while the brooders are stacked. Includes 6 plug electrical outlet strip with 4 ft. cord and 3 feed or water troughs per brooder (15 altogether). These are ready to use once assembled. Overall Dimensions: 32” Wide, 38” Front to Back, and 65” high. 110 Volt, combined wattage 1500W. Lids provided for all brooders. 10 attraction light bulbs included. + freight, must be shipped Fed Ex Ground or by truck. This website will not calculate correct shipping charges for this item, you will be notified by email of the correct shipping charges after placing the order, or call to get a quote first. Ships in 7 boxes, 246 pounds total shipping weight.